The National Open (June 7-11, Las Vegas) began with a surprising result on board one, as the legendary Viktor Korchnoi drew from a losing position against the young Erkin Gurbauzade from Azerbaijan. 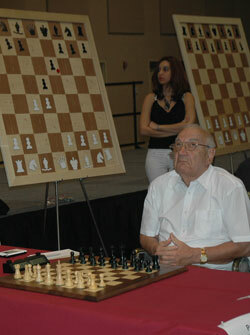 Korchnoi was down a piece with very little compensation. Korchnoi is known for being one of the greatest fighters in chess history, and he showed it off in this game, steering the game into the only conceivable drawish position....Rook vs. Rook and h and f-pawns. This is a famous endgame which is hard and sometimes impossible for the side up to pawns to win. In the second game, Korchnoi had a much easier time against Life Master Viktors Pupols. Pupols played a bizarre opening with White, which Korchnoi quickly punished. Another notable round 1 upset was 13-year-old Christian Tanaka's victory over Emory Tate. Tanaka was well aware of Emory's attacking prowess, so he tried to avoid crazy tactics.When I asked if Emory had made a key mistake or if he was proud of one particularly move, Tanaka said that there wasn't a single move that stood out. "He got into time pressure, and I managed to take advantage of it." After two rounds, there are 20 perfect scores in the open. Click here for the crosstable. The top guns are playing well. In round two Nakamura, Shabalov and Akobian all made winning with white against Senior Masters seem easy. and watch the games live on monroi.com!